So yesterday I was debating a run at the gym after work. I hate the treadmill...but I knew that I was 3.66 miles behind Jason in the mileage challenge and that if I didn't run I very well would fall helplessly and hopelessly behind if he ran today. But I really didn't want to do it! I changed my clothes at work so that I didn't have any thought, excuse or even time to pause. I wanted to drive right there and just get it over with!!!! Yes I did say that I was 3.66 behind. It was no coincidence that I stopped running when I was one hundredth of a mile ahead of him. So this morning....I knew he was planning on running....I had to run!!!! 4.53 miles later and I was shot!!!! My legs were done!!! So I sit at 4.54 miles ahead. Let's see if I that's enough for the win!!! My eating is pretty well under control at the moment. I'm just working on being 'normal' with eating. Nothing crazy in either direction...normal!!!! 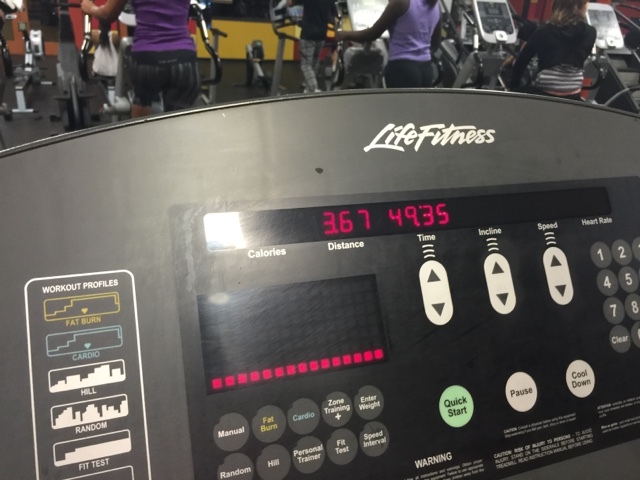 ugh, the dreadmill...good for you though! You are amazing!! I was just looking at your weight loss journey and it is so inspiring. I see you recently went through a breakup. Fitness is one of the best ways you can divert your pain and invest time back in yourself. You're doing everything right. Keep it up!! !